How the hotel would have looked. DEVELOPER JOHNNY RONAN has suffered a fresh planning blow after Wicklow County Council refused planning permission for his planned €50 million ‘sports’ hotel near Enniskerry. The decision by Wicklow County Council follows on from last month’s decision by Dublin City Council to refuse planning for Ronan’s 22-storey Aqua Vetro tower on Dublin’s George’s Quay. 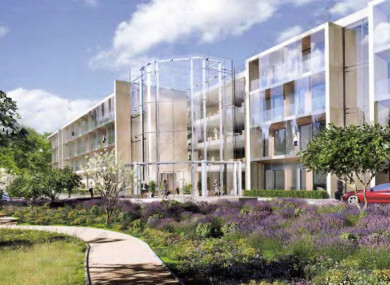 The plan by Ronan’s RGRE J & R Valery Ltd involves a 141-bedroom hotel at St Valery’s, Enniskerry, Co Wicklow marketed towards the sports tourism sector with a particular emphasis on cycling. It consists of a four-storey over basement hotel including a restaurant, bar and cafe area. However, the council refused planning permission on two grounds, stating that the proposal by reason of its scale and bulk would be an intrusive feature and would impact on views from the N11 to St Valery’s and would be detrimental to the visual amenities of the area. The council also stated that the development of the hotel would be premature pending the determination by Transport Infrastructure Ireland (TII) of a road layout for the area. The decision will mean 120 potential jobs will now not go ahead if the decision is not overturned on appeal to An Bord Pleanala. A previous hotel proposal was turned down for the site but Ronan’s architects stated that bulk and massing of the new proposal had been significantly reduced. However, Ronan’s firm obtained from Wicklow County Council a six month extension to the application to allow him time to meet the council’s concerns. The plan was facing opposition from some locals. WB and MM Somerville told Wicklow County Council that they are objecting to the plan having regard to the scale, size and height of the hotel. In a separate objection, Eric and Cara Culliton stated that the development “would ruin our existing level of privacy as we will be overlooked and destroy our scenic views forever”. However, traders from Enniskerry lodged a submission in support of the proposal stating that the plan will be a hugely beneficial addition to the community. They stated that the target market of the hotel for sports tourism will serve to showcase the beauty of the area. Email “Johnny Ronan's plan for a €50 million sports hotel in Wicklow has been rejected”. Feedback on “Johnny Ronan's plan for a €50 million sports hotel in Wicklow has been rejected”.